WORCESTER - There’s a great big metaphysical joke at the core of the genius that was Henri Matisse, and it has to do with the idea of work, of labor, of effort. Matisse, in his full-throated maturity, represents the opposite of these things. His work stands for ease and effortless beauty, and for an almost total absence of pressure - the pressure of careful outlines and fastidiously filled-in paint and, by extension, of life itself, with its repressed desires, irreconcilable demands, and emotional heavy-lifting. Nowhere in New England is there a better example of what I’m talking about than this Matisse painting, which is on display - alongside two other fine Matisses - at the Worcester Art Museum. It’s called “Petit Interieur a la Table de Marbre Ronde, Palmier et Personnage’’ and it was painted in 1947 - seven years before the great man’s death. It is not what you’d call a masterpiece: Its breezy execution seems incompatible with the very notion. 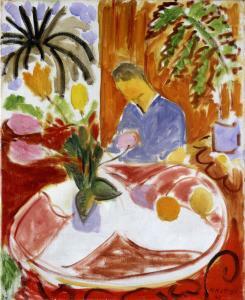 But it is typical of the mature Matisse at his bewitching best. The colors hum. The brush strokes, loose and relaxed, create a sense of airy plenitude. One cannot say where drawing ends and painting begins. Descriptions of observed phenomena - a palm tree, a flower, a head - become simplified signs, and these signs become rhyming and complementary components in an overall decoration. The seated figure’s head, for instance, is roughly the same size, color, and shape as the flowers and fruit. Serpentine lines on the table rhyme with the stalks of the flowers, reinforcing the sense of flourishing growth evoked elsewhere in the picture. Patterned lines - the sprouting palm, the plant’s jagged leaves - punctuate the picture, like faster rhythms amid more leisurely, spaced-out ones, so that the picture seems to expand and contract, like the breath of a relaxed lover. The blue pot on the right breaks open that side of the picture, echoing both the blue seen through the large window and another blue pot on the table. The touch is so light in parts that the oil paint functions like watercolor. The painting is about conferring balance and proportion on rapturous sensuality - dizzying beauty with no diminution on either side. Matisse was in fact one of history’s great pressurized personalities. Habituated to harsh criticism and to countering such criticism with feats of the most strenuous concentration, he was prone to panic attacks, insomnia, nosebleeds, chronic anxiety, illness. It cost him a lifetime of unstinting strain to get to the point where he could turn out pictures like this.